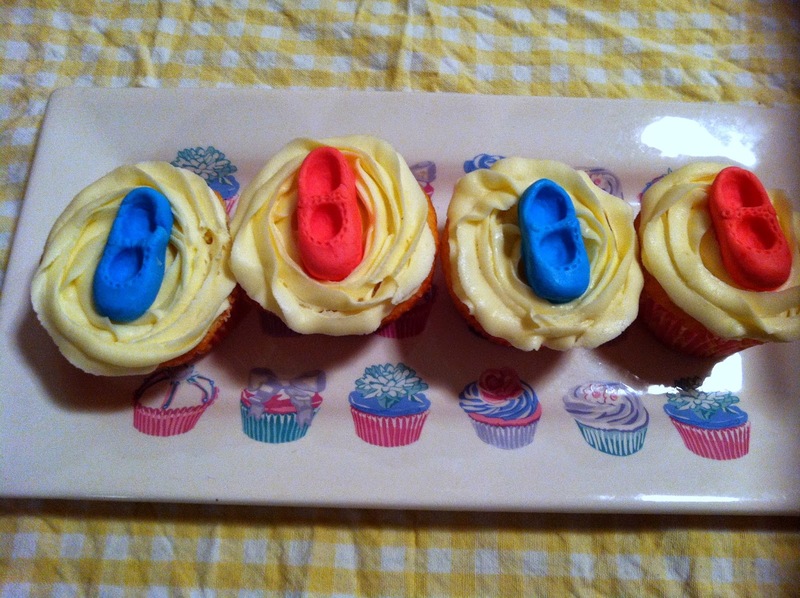 Michelle is going on maternity leave, so to bid her adieu for now, I made her some lemon cupcakes with fondant baby shoes on top. The lemon cupcake recipe and lemon buttercream is from The Primrose Bakery, and can be found online here. 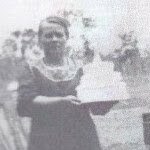 There appears to be a mistake in the buttercream recipe, as it refers to milk in the method but not in the ingredients. Working from their vanilla buttercream recipe, I estimated that it needed 30ml of milk, which together with 30ml of lemon juice, makes 60ml of fluid, as per the vanilla buttercream. This seemed to work just fine. The piping is not as neat as it could have been, because I suspect I used my pastry tip instead of my icing tip, but that's OK. I had a sneaky taste of both cake and buttercream, and they are both pleasantly lemony and delicious. 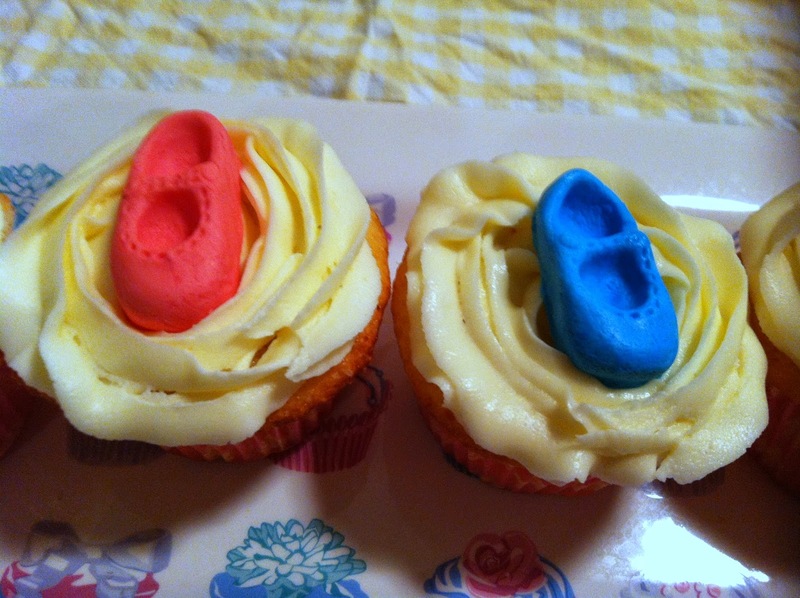 The shoes are made from fondant that I hand-coloured in with red (pink) and blue colouring, and using this mould (I got mine from Cake Deco in Port Phillip Arcade). I didn't bother messing around with the bows or flowers as I have no idea if Michelle is having a boy or a girl. This is a super easy idea for a baby shower, and the cakes are tasty too. 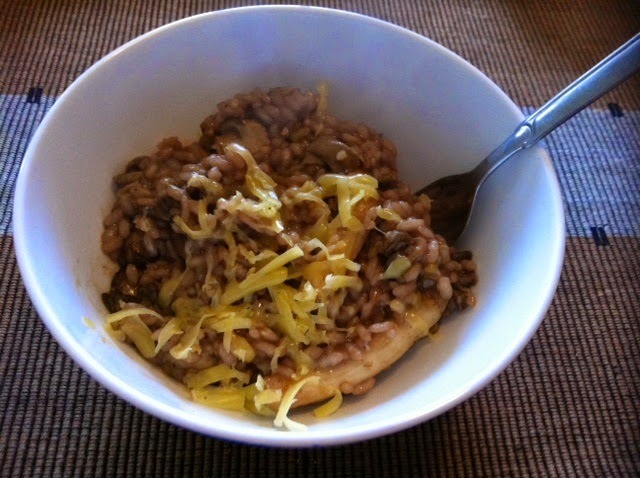 This week, Kayte chose Mushroom Risotto from Modern Classics 1 as our Donna Hay recipe. You can also find it online here. I wasn't too sure about this one at first, as I can be a bit picky about risotto and in the distant past, I did have a bad experience with a gloggy pumpkin risotto. However, this risotto was really tasty, and came together with ease. The mushrooms really made it by adding "meat" and flavour. I used Swiss brown and oyster mushrooms, but you can use whatever you have on hand. The recipe said to use dried porcini mushrooms as well, but I hate the taste, smell and texture of those, so I left them out. To see what Kayte, Margaret, Chaya and Sarah thought of this week's dish, visit their websites. All of it is delicious, and because it is designed for those dining before going to a show, it comes out really quickly - no waiting around. This was as good as I remembered from last time. Trust me to remember the dessert! The staff were prompt and courteous, and didn't indicate that they even noticed that Tim and I were dressed for the road rather than the theatre. I have posted all of my photos from the exhibition on my travel blog here, if you are interested in some more glittering costumes. We wandered over to The Venetian which, you guessed it, is decked out to transport you to Venice. Gondola ride anyone? Tim and I sat and ate gelato while listening to a classical music trio entertaining the crowds. Sadly it was not on the nights we were there, and last time I was in Vegas I didn't go because I messed up and bought a ticket for another show on the same night in Los Angeles which I could not attend and I decided to just wear my mistake. For French Friday with Dorie this week, we made Provencal Vegetable Soup. This is a stock-based soup chock full of pasta and vegetables. As you can see, this soup contains lots of brightly coloured vegetables. Mine is even brighter because I substituted sweet potato for white potato in the recipe. I could only buy 4 ears of corn, so I opted to leave it out rather than spend money on unwanted corn. As ever, I reduced the liquid more than I probably should have, but that didn't matter to me - I liked the chunkiness of my soup. Overall, I rated this soup as delicious. To see what the other Doristas thought of this soup, visit the LYL section of the FFWD website. For Wednesday with Donna Hay this week, I chose something that has long been on my list to make - Yorkshire puddings. This recipe comes from p120 of Modern Classics I.
I had read that the requirements for successful Yorkshire puddings are a hot oven and hot oil (or in this case, lard). Accordingly, I made sure of both before adding the batter to the muffin trays. 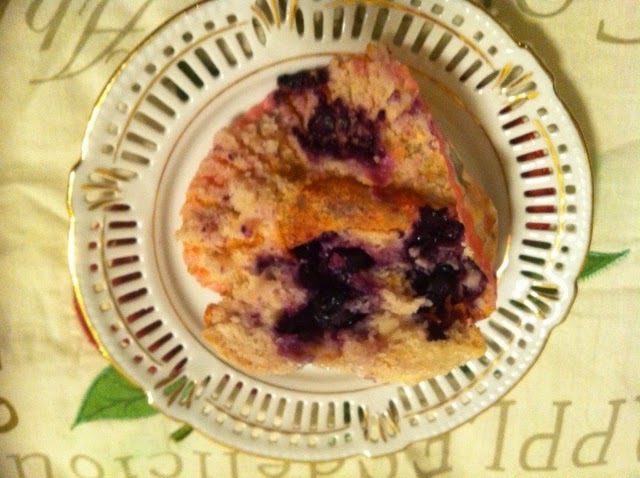 Everybody loves a muffin, and so it seemed when I baked Donna Hay's Blueberry and Yoghurt Muffins with Lemon Sugar, a recipe I found in Sunday Style magazine. These muffins disappeared like hotcakes, and I can understand why, having eaten one and a half of them myself. 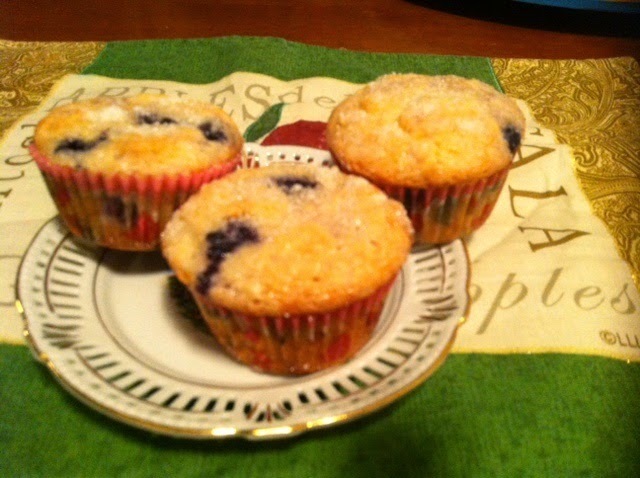 They are tangy and lemony, with bursts of juicy blueberries in every mouthful. The lemon sugar on top adds a pleasant crunch. I would definitely make these muffins again - they are simply scrumptious. I am a huge fan of dates, and I eat them like lollies. Accordingly, when I saw a recipe for date and apple cakes on p69 of the July 2014 edition of Taste magazine, I had to make them. These date and apple cakes tend towards the healthier side of things, as they contain spelt flour instead of plain flour, and coconut oil. They contain comparatively little sugar, with the sweetness coming primarily from the dates. Best of all, they are moist and delicious. The magazine served them with a caramel sauce, so that they resembled little sticky date puddings, but I didn't bother with the sauce. Preheat your oven to 180 degrees Celsius and spray a 12 hole muffin tin with cooking oil. Put the dates and water into a small saucepan, bring to the boil, then simmer for 2 minutes. Take the saucepan off the stove then stir in the bicarbonate of soda. Allow the mixture to cool. Beat the coconut oil and 2 tablespoons of sugar together until light and creamy, then add 1 tablespoon of flour and 1 egg. Beat to combine, then repeat with another tablespoon of flour and the remaining egg. Fold through the grated apple and half of the remaining flour, then fold in the baking powder, cinnamon, date mixture and the last of the flour. Using an icecream scoop, divide the mixture evenly between the 12 holes of the greased muffin tin, then bake for ~25 minutes. Cool the cakes in the tin for 5 minutes before unmoulding onto a wire rack to cool completely. Having the luxury of staying overnight at the Grand Canyon meant that we could be there for sunset and sunrise, which we were informed could be spectacular because of the different light and shade that the Canyon takes on with the movement of the sun's rays. Unfortunately, sunset was a bust, because it was an overcast evening. This meant that we had to rise early the next day (around 5.30am at the time of year that we were there) in the chilly weather to see the sunrise. Can you see the face of the person in the rock face below? Isn't this steam engine one of the most handsome pieces of machinery you have seen? Juan was very much a local celebrity in his own right, although from the video that we saw, I think I would have gone nuts trying to buy anything from him.